On November 11, 1865, Mary Edwards Walker became the first woman to receive the U.S. Congressional Medal of Honor, The United States of America's highest military honor. 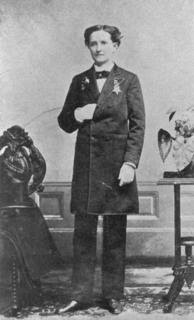 Mary Edwards Walker was born in the Town of Oswego, New York on November 26, 1832. Raised by progressive christians that nurtured her defiant spirit, They let her wear traditionally male clothes; she refused to wear dresses and corsets even in school. Mary first attended Falley Seminary in Fulton, New York before receiving her medical doctorate at Syracuse Medical College, even though women at the time were discouraged from pursuing medical degrees. While at Syracuse she met and married another doctor, Albert Miller. At the wedding Walker wore trousers, refused to include "obey" in her vows, and retained her last name. All of which Albert seemed fine with, but he was unfaithful so the marriage ended. When the American Civil War began, she volunteered for the Union Army. At the time the U.S. Army had no female surgeons, and at first she was allowed to practice only as a nurse before her skills and demand superseded social restrictions. In September 1863, she was employed as a "Contract Acting Assistant Surgeon" becoming the first female surgeon employed by the U.S. Army. During her time as a surgeon in the Civil War she came across female soldiers dressed as men. There are 400 documented cases from both sides of the conflict with evidence supporting that up to an additional 1,000 other cases of female soldiers that were either not discovered, or were to some degree but were kept secret by fellow soldiers due to skill and camaraderie. One such soldier was Frances Hook, whom served with the blue coats for 3 years (reenlisting every time she was discovered, under various versions of a male personality named Frank). Hook and her brother enlisted together, she was only 14 at the time of enlistment but claimed to be 22. After her brother was killed she was taken prisoner by the Confederate army and her true identity was discovered. The grey coats were so impressed by her courage that Confederate President Jefferson Davis offered to make her a lieutenant if she joined his army. In true Yankee form, Hook declared she'd rather be a private in the Union Army than a lieutenant for the Rebels. When Mary Walker found out about it she campaigned for the Union to reinstate her as lieutenant. When they declined Walker alerted the press about the bravery and heroics of a young female soldier. Hook gave interviews and was written about extensively but the army again refused to reinstate her. She promised reporters she would head home, but with no home to return to, many speculated that she again reenlisted under a new name. Walker continued as a surgeon for the union, inspired by female Union spies (such as Sarah Emma Edmonds, a white Canadian woman who spied on the rebels disguised as a black man) Walker requested the War Department employ her as a spy. Records show she was denied but In 1864, she was captured by Confederate troops, and arrested as a spy, just after she finished helping a Confederate doctor perform an amputation. It wasn't uncommon for Walker to cross enemy lines to tend to the wounded no matter who they fought for. Regardless, she was imprisoned at Castle Thunder in Richmond, Virginia, until she was released in a prisoner exchange. After the war Walker was recommended for the Medal of Honor for bravery 'above and beyond the call of duty', by Generals William Tecumseh Sherman and George Henry Thomas. On November 11, 1865, President Andrew Johnson signed a bill to award her the medal, becoming the first woman to receive the Medal of Honor. In 1917, her name was dropped from the official Medal of Honor Roll (along with over 900 others) when the U.S. Congress created a pension act for Medal of Honor recipients. Walker still proudly wore her medal on the lapel of her 'masculine' suits. On February 21, 1919, Walker died at the age of eighty-six. She was buried wearing one of her trademark black suits (see photo). In 1977 her medal was restored posthumously by President Jimmy Carter. Mary Edwards Walker is still the only woman to receive the Medal of Honor.